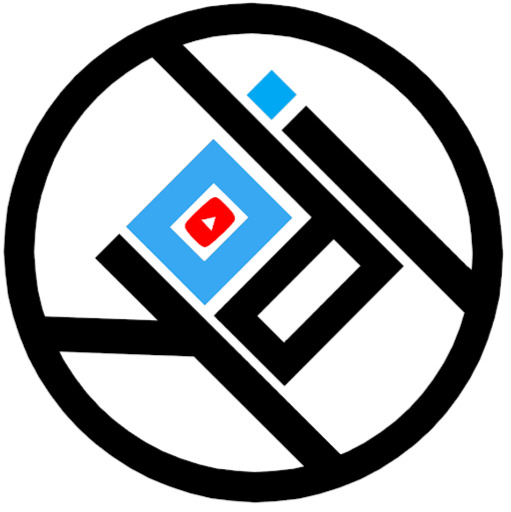 With the realization that a lot of what I do lately are mostly stressful and that a lot of my priorities are slowly dying in spite of – or perhaps because of – having been too cautious and afraid to make sudden decisions, I registered for the Mt. 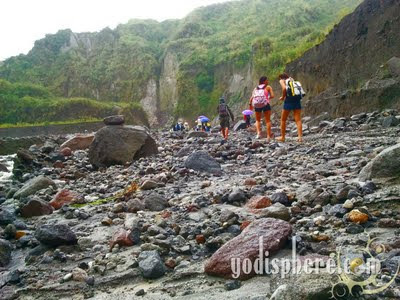 Pinatubo bloggers’ trek without a second thought. Also, I guess I badly need to remove myself from the mad rush of my daily routine. However, the night before the trek I got this second thought and asked myself what the hell do I want out there in the endlessness of ashes and volcanic rocks? I’m silly and mad sometimes, I know that, and maybe this is one of those find-yourself-on-spiritual-walk kind of thing I used to do before. So I go, though it seemed unlikely that anything spiritual might suddenly expand there on the ashes. I tend to have these clear mind and flow of ideas on long airplane ride or lazy walk, but I tend to forget them the following day. This time, I made a point to remember, made mental notes and write down all my Mt. 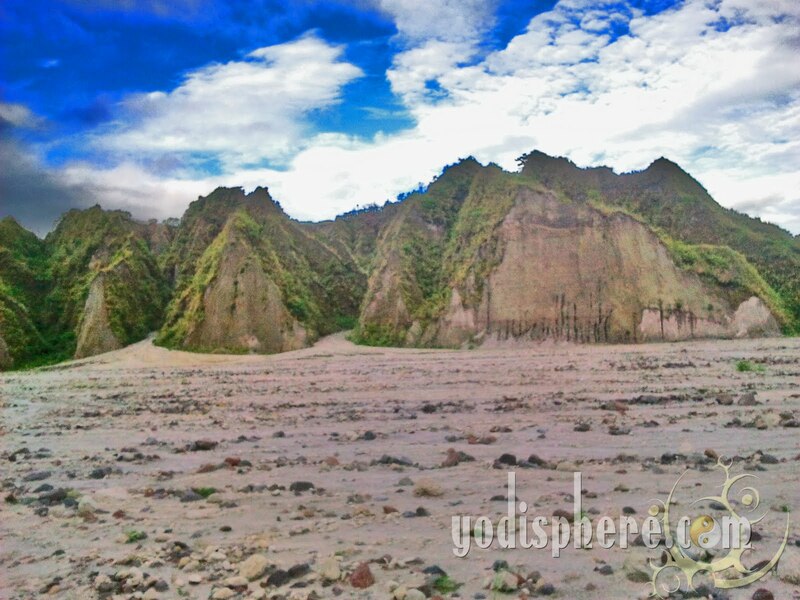 Pinatubo trekking thoughts. It’s been a while but I can still feel the medley of dark volcano rocks, ashes, pieces of burnt wood and dwarfed grass under my feet. Nearby was a fellow blogger fussing with his camera against the romantic rain and mud, questioning his decision in joining this Pinatubo climb. On the horizon are silhouettes of mysterious mountains, blanketed by struggling greenery, hiding behind droplets of rain and dreary fog. The 4x4 jeep ride going to the main trail, its funny rubber wheels throwing mud at me, was a cheerful mess - like that childish euphoria when I first learn how to ride a bike. Activities like this, small things that can bring up childhood carefree feelings in our stressful adult world are priceless. 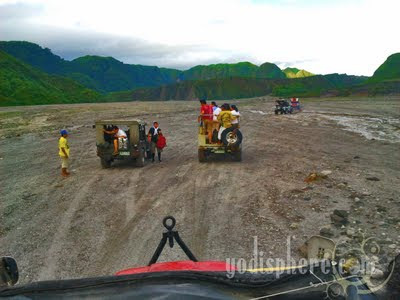 Strong lahar mudflow, during Pinatubo’s tantrum years slightly divided the terrain in half thus creating a sunken semi-flat trail now famous for trekkers. This is actually a walled trail, like a snaking rat maze slightly tilted upwards so you know where the exits are. I spied other trekkers staring at these walls of cracked volcanic ash, hardened by time and sewn together by the roots of wild talahib grass, marveling at these sacred walls. I paused to catch my breath and stared at these walls too, and realized why human race is creating monuments of war and destruction – creating pieces of bronze art sculptures, parks, beautiful historical markers and ornate mausoleums. It is not to remind us of death and suffering but an innate desire to create beauty out of chaos. 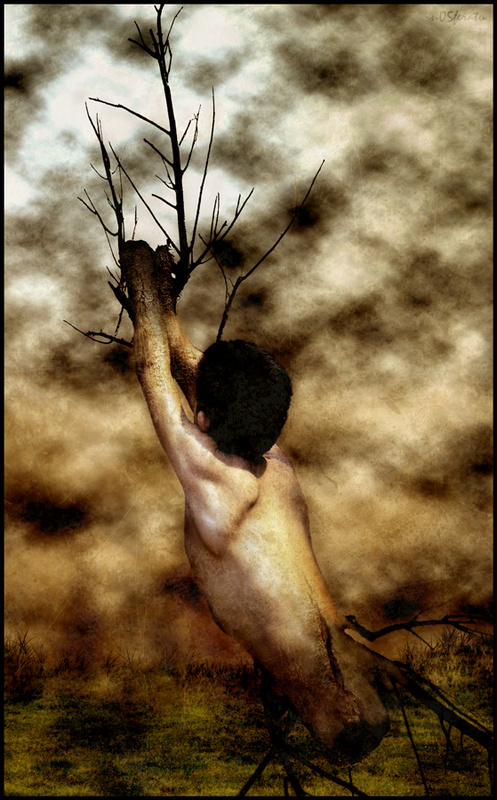 We adopted it from nature maybe that is why we call it “human nature” – the ability to turn pain into butterflies. Therefore I am wrong. 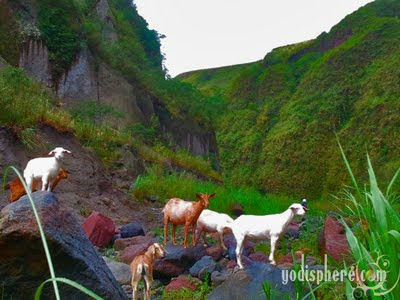 There is some kind of spirituality on the Pinatubo ashes after all. 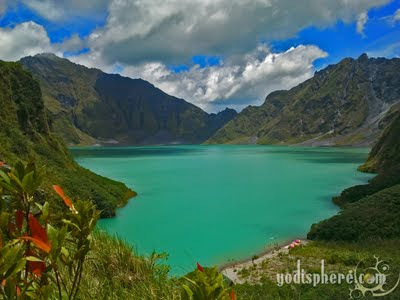 Fools rush in to Pinatubo with only one goal of having a glimpse of its fabled turquoise crater. 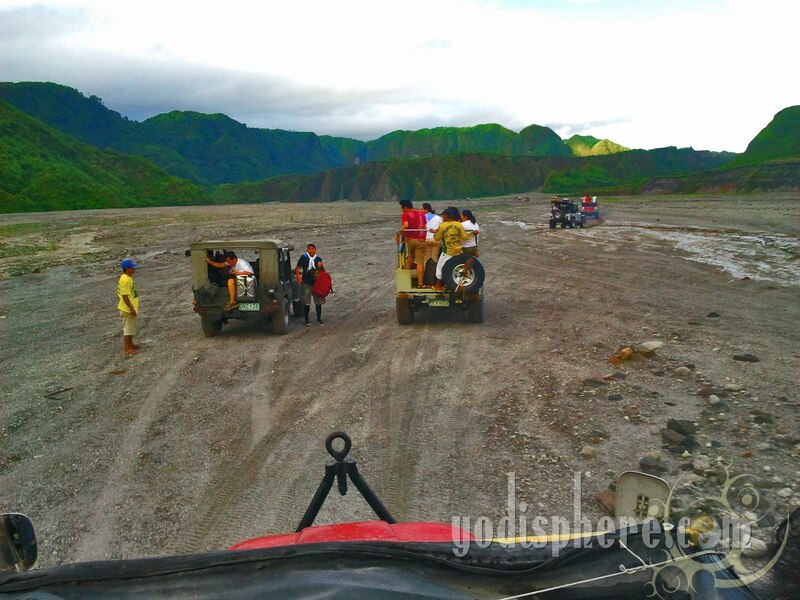 It is worth it, that I can assure, but you don’t go walking and climbing the Pinatubo just to see the crater. 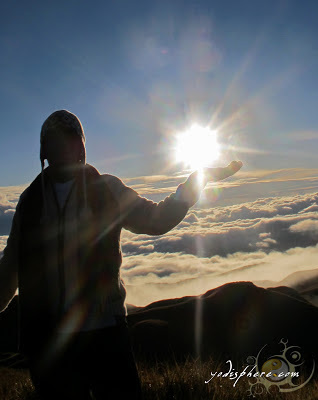 Why not use these moments of monotonous trekking and walking to expand your awareness, relax your mind, wash away the stink of your chaotic public and professional adult life and increase your experience of freedom? By slowing down your fast-paced life and focusing on each step – the journey rather than the destination – a trek to Pinatubo could be totally relaxing and can stretch more time for yourself. Being on nature and traversing a demanding terrain has taught me that life is simple, and you can cross any pass if you have the spirit. The mysterious appearance of a place, a tiny leaf or a colored rock on a trail can reveal to you something about the complexities of life hidden within. You just have to know where to look, and how to hear the colors, and how to embrace the sounds. 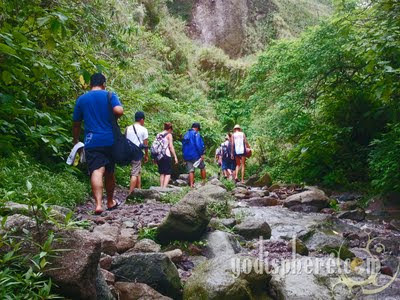 Pinatubo hiking could be also intellectually invigorating and emotionally relaxing which can boost your memory and sharpens judgement. Each step can allow you to temporarily shrug off time and savor your personal solitary moment. 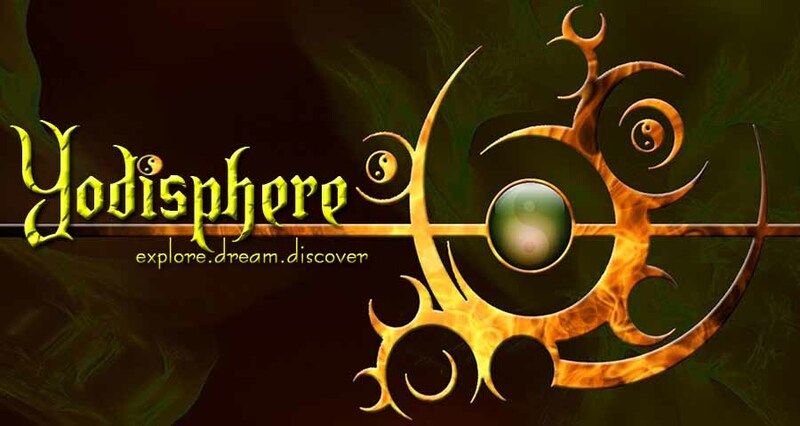 Moreover, this trek will not only stimulate your different senses by encouraging you to be more admiring and perceptive of the world around you but it will also give you a chance to reflect inwards and be more honest and introspective with yourself. This is how you can best experience Mt. Pinatubo trekking – walk with intention of mindfulness. So grab your trekking sandals and get moving. Something serene awaits you there! 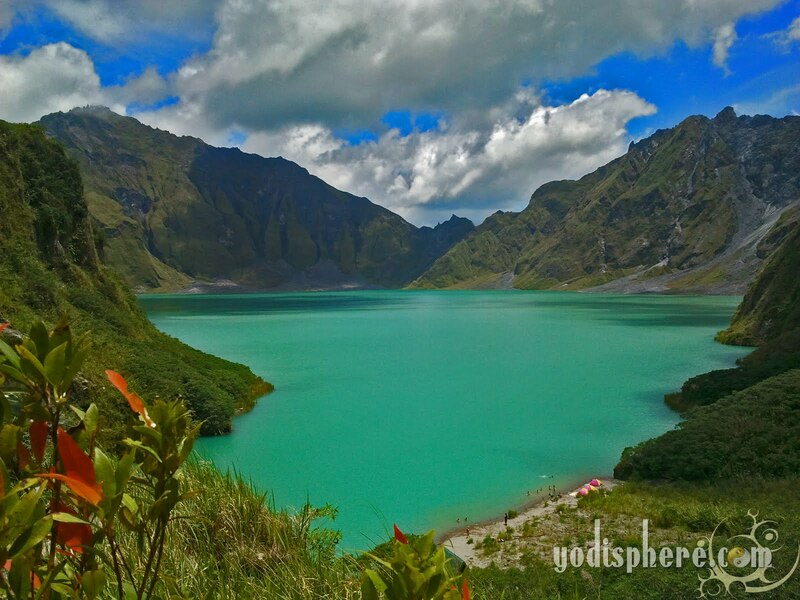 Plus of course a dive into the legendary turquoise Pinatubo lake is an extra treat.